Dental amalgam, is made of about 50% of one of the most potent toxins known to man – the heavy metal mercury. Dental amalgam manufacturers provide hazardous warnings to the public about the risk of consumers being exposed to mercury from their product as well as the adverse effects to our environment and dental workers.The following is taken from an official amalgam manufacturers safety data sheet. it is well documented through autopsy studies that humans with dental amalgams placed have toxic levels of mercury in their brains and/or kidneys. The widely documented environmental dangers of mercury have led to a United Nations initiative to phase out mercury based products world wide. This initiative has been named the Minamata Convention and is currently under negotiation. All of our dentists at Laser + Holistic Dental are members of Australians for Mercury Free Dentistry and believe that all mercury based dental products should be immediately phased out due to health, occupational risk and environmental concerns. At Laser + Holistic Dental we follow strict mercury removal protocols to protect you, our staff and the environment – which you can learn more about here. At Laser + Holistic Dental we avoid this risk all together but not using nickel based products in any of our general dental and orthodontic services. Another metal that is gaining widespread use for dental and surgical procedures is titanium. Titanium orthopaedic and dental implants are often the most common option available. As with other transition metals, there are a group of people who are adversely reacting to titanium and titanium oxide – which is commonly used as white pigment. Exposure to titanium can occurs whether it is in surgical implants, toothpaste, processed foods, cosmetics, jewellery, sunscreen and white pigments. The symptoms and signs of an allergic reaction to metals used in dentistry can manifest both in and around the mouth as well as other parts of the body, especially the skin and gastrointestinal tract. Clinical results have shown the metal free alternative material of zirconia implants to be successful even in patients that have previously shown signs of titanium allergies.14 For this reason Laser + Holistic Dental only uses zirconia implants as a durable, natural looking, cost effective alternative which you can learn more about here. Other bone conditions associated with fluoride exposure are arthritis, fractures, skeletal fluorosis and the cancer osteosarcoma. Several human epidemiological studies have found an association between fluoride in drinking water and the occurrence of osteosarcoma (bone cancer) in young males.22 Research conducted at Harvard found that young boys had a five-to-seven fold increased risk of getting osteosarcoma by the age of 20 if they drank fluoridated water during their mid-childhood growth spurt (age 6 to 8).22Another grave concern about the practice of artificially fluoridating water supplies is that the source of fluoride is a hazardous industrial waste product from the fertilizer industry that is laced with the carcinogenic heavy metal contaminant arsenic.23 Furthermore, there is no monitoring of exposure to fluoride levels in the citizens who are living in fluoridated communities to check on any adverse side effects.It is ironic that the recommendation of using fluoride to reduce dental decay has infact created another serious dental condition specifically known as dental fluorosis which is a permanent and often cosmetically disfiguring state of yellow and white blotches of the mineralization in the adult teeth. 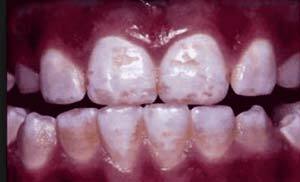 Dental fluorosis may also be an indication that fluoride may be impacting on other developing tissues. Chinese and Indian studies confirm that in areas of naturally high levels of fluoride the first indicator of harm is dental fluorosis in children.24 In the same communities many older people develop crippling skeletal fluorosis with fluoride levels below 1ppm which is equivalent to the concentration of artificial fluoridation doses.24Fluoride has a history being used for medical and dental purposes with harmful results. The British Government’s York Review estimated that up to 48% of children in fluoridated areas worldwide have dental fluorosis in all forms, with 12.5% having fluorosis of aesthetic concern.25 Clinical trials were conducted using high doses of fluoride to treat osteoporosis in post menopausal women, which ironically led to an increase in the serious complication spinal and hip fractures.26Today we have a situation that our community is now being overexposed to fluoride as a legacy of decades of fluoridation of our public water supply. Every plant, and animal that grows in fluoridated regions concentrates the fluoride due to its bioaccumulative nature within our food chain. Exposure from other sources has increased as well. Other sources include processed foods made with fluoridated water, fluoride-containing pesticides (eg cryolite), tea leaves, fluorinated pharmaceuticals and teflon pans. The dental industry provides numerous fluoride added products for home use in addition to the spectrum of slow releasing fluoride-added dental filling materials. 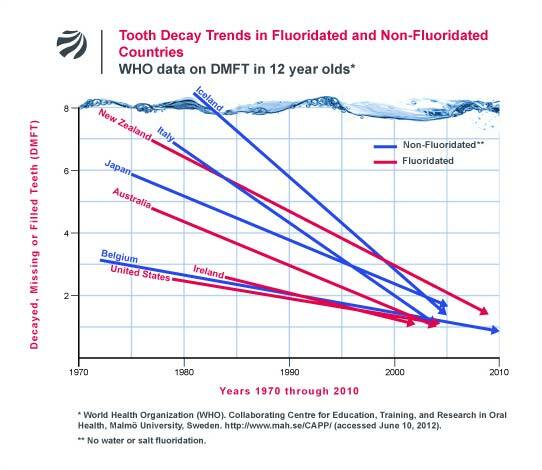 It is now widely acknowledged that exposure to non-water sources of fluoride has significantly increased since the water fluoridation program first began and overexposure is a real problem.27 It has taken 50 years for the USA Department of Health and Human Services in 2011 to review and recommend that the concentration of water fluoridation programs be reduced to 0.7ppm to compensate for the elevated levels from other sources.28Our current Australian experience is that there is no concession in Dental health policy to adjust fluoridation levels in line with the trend of other nations who have either stopped fluoridation or have at least reduced the concentration of fluoride in their public water supply. The current National Oral Health Plan for Australia 2015-2024: Healthy Mouths, Healthy Lives, recommends that communities with populations of over 1000 people should have access to fluoridated water supplies – a concerning proposition given the evidence against water fluoridation.29At Laser + Holistic Dental, we exercise the precautionary principle and choose not to use fluoride added products such as toothpastes, mouth rinses, dental filling materials and we even have reverse osmosis water filters fitted centre wide so our water is fluoride free. Human exposure to the chemical Bisphenol A (BPA), should be of concern as it’s a known endocrine disruptor that may contribute to physical and neurological problems during early developmental stages in a person’s life.30 Research has also shown BPA to interfere with proper thyroid function and also possibly be carcinogenic.31BPA was introduced to our culture in the 1950s sparking the “plastics revolution”. This ubiquitious chemical is bioaccumulative and since the 1930s has been classified as a xenoestrogen because of its capability to interrupt the network that regulates the signals which control the reproductive development in humans and animals.32Available data from extensive biomonitoring studies of thousands of people in many different countries clearly indicate that the general population is exposed to BPA and is at risk from internal exposure to BPA. Scientists reviewed 80 published human biomonitoring studies that measured BPA concentrations in human tissues, urine, blood, and other fluids, along with two toxicokinetic studies of human BPA metabolism. These studies overwhelmingly detected BPA in individual adults, adolescents, and children.33The negative impact of BPA on our environment should not be overlooked. BPA levels are detected in waterways, air and animals. BPA is one of the high volume chemicals produced worldwide with greater than 8 billion pounds produced each year and more than 100 tons released into the atmosphere each year by yearly production.33 Animal tests of mammals, fish and birdlife show that BPA is an estrogen-like chemical that causes negative reproductive and developmental effects.33We are directly exposed to BPA mainly through dietary and skin absorption of plastic products such as canned foods with a plastic coating and plastic bottles containing beverages. Touching receipts, even handling our plastic money will rub off some BPA into your skin. Of even greater concern is that maternal stores of BPA pass through the placental barrier and also enter into breastmilk in the developing baby.34, 35, 36During the “plastics revolution” sixty years ago, saw the advent of Mercury free alternatives to amalgam fillings becoming available. The development and use of “white” resin fillings means dental patients, dental workers and the environment are no longer exposed to mercury with the additional bonus of a more natural looking filling for the patient. Dental composites are materials consisting of an organic resin matrix that reinforce inorganic filler and a silane-coupling agent. Originally the white fillings were made from polymers derived from plastic derivatives containing the chemical BPA and were not very strong. Dental sealants used in paediatric dentistry were found to be leaching BPA.37 Today BPA free filling alternatives are available that are durable, cost-effective and natural looking.In 2008, the International Academy of Oral Medicine and Toxicology (IAOMT) undertook a laboratory study of BPA release from a range of commercially available dental composites under human physiological conditions: 37º C, pH 7.0 and pH 5.5. The dental materials used at Laser + Holistic Dental were supplied to be included in the study for independent testing. The results confirmed the biocompatibility and minimal exposure to BPA from the dental filling materials selected for patient use at Laser + Holistic Dental.Laser + Holistic Dental would also like to point out that other dental products are BPA free such as Invisalign aligners and Vivera Retainers do not contain Bisphenol-A or phthalate plasticizers. These aligners and retainers are made with USP Class VI medical grade, high molecular weight, polyurethane resins. Tests have been conducted to determine the biocompatibility of these materials, and show that they are biocompatible and pass all applicable regulatory requirements and thresholds for human wear in the mouthOther measures that Laser + Holistic Dental have undertaken to reduce our direct and environmental exposure to BPA is choosing plastic alternatives such as glass, ceramic containers and paper products from sustainable sources. The occurrence of latex allergy within our community is a relatively fairly recent phenomena. There are very few research studies conducted to evaluate the prevalence of this condition. More and more people are becoming affected by latex allergy, especially in the healthcare sector.38 Latex allergy can be a potentially life-threatening reaction so much so that it is now standard procedure for all dentists to screen their patients to identify prior to treatment if their patient has been diagnosed as allergic to latex.Latex or natural rubber is the substance obtained from the sap of the Hevea brasiliensis tree. After the addition of preservatives and stabilisers, it is dipped into a mould, then heated and dried. During manufacturing, chemicals are added to render latex elastic and stable to heat by vulcanisation (heating in the presence of sulfur). Further chemicals are added for strength and durability, including mercaptobenzothiazole, thiurams and carbamates. Sometimes a dry powder lubricant (usually corn-starch, or talcum powder) is added to the surface of the latex to prevent the rubber surfaces from sticking together. Allergic reactions can occur to latex protein as well as the chemicals added to it.39There is a spectrum of adverse reactions from being exposed to latex. The most serious is the immediate anaphylactic reaction which is potentially life-threatening (Type 1 allergic reaction) then the delayed Type IV hypersensitivity immunological reaction manifesting as a contact dermatitis. It is thought that this reaction is caused by the chemicals that are used to manufacture the latex product. Another unpleasant and less serious reaction is known as “irritant” contact dermatitis. What immunologists agree on, is that the more one is exposed to latex either by contact or inhalation, the greater the likelihood of developing some form of latex allergy over time. Avoidance of latex products is the best and only strategy available at this time to manage latex allergy and to be prepared should a health emergency occur.Below is a list of some products that use latex including those used in delivering dental services, especially root canal fillings, oral surgery and orthodontics. Interestingly, people may not be aware that their ‘allergic” symptoms and food intolerances to may actually be the presentation of symptoms triggered from exposure to latex. Common symptoms include: hives, swelling, runny nose, sneezing, headache, itchy and red eyes, sore throat, abdominal cramps and asthmatic symptoms. The dental profession uses many latex based products such as rubber surgical gloves, rubber dam, orthodontic elastics and ties and gutta percha for root canal (endondontically) treated abscessed teeth.42 Fortunately latex alternatives now exist for all of these products and Laser + Holistic Dental has introduced all of these into the clinic as a universal precautionary measure. Natural rubber based dams and gloves have been proven to be less effective at preventing mercury vapour generated from replacing amalgam fillings from passing through, thereby offering less protection for the patient and dental workers from mercury exposure.43 Nitrile ‘rubber’ dam and gloves are not only latex free but provide better protection against mercury exposure and these are used exclusively at Laser + Holistic Dental. As with so many issues in healthcare, more research is needed. In the meantime, heeding caution, it is best to choose products and services that are least likely to cause any adverse reactions maintaining a standard of duty of care. 2. Is Dental Amalgam Safe For Humans? 19. Are fluoride levels in drinking water associated with hypothyroidism prevalence in England?